Rekit is a toolkit for building scalable web applications with React, Redux and React-router. It&apos;s an all-in-one solution for creating modern React apps. It helps you focus on business logic rather than dealing with massive libraries, patterns, configurations etc. Rekit creates apps bootstrapped by create-react-app and uses an opinionated way to organize folder and code. It&apos;s designed to be scalable, testable and maintainable by using feature oriented architecture, one action per file pattern. This ensures application logic is well grouped and decoupled. Rekit Studio: the real IDE for React, Redux development. Command line tools: besides Rekit Studio, you can use command line tools to create/rename/move/delete project elements like components, actions etc. It has better support for Rekit plugin system. Create a simple counter in 1 minute! Show the latest reactjs topics on Reddit using async actions. This will install a global command rekit to the system. Rekit is developed and tested on npm 3+ and node 6+, so this is the prerequisite for using Rekit. Webpack dev server: http://localhost:6075. Just what create-react-app starts. Rekit Studio: http://localhost:6076. The IDE for Rekit projects. This repo contains multiple packages managed by yarn workspaces. 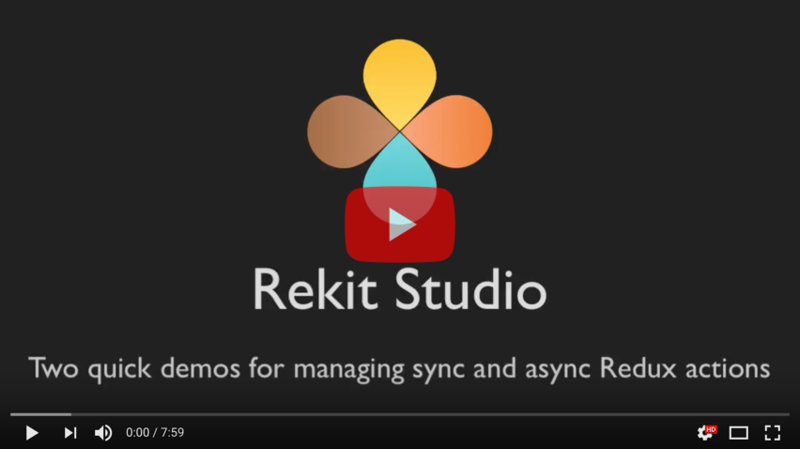 rekit-studio Dedicated IDE for Rekit development, uses rekit-core to manage project too. rekit-plugin-redux-saga Use redux-saga instead of redux-thunk for async actions. rekit-plugin-selector Support selectors by Rekit cli. It&apos;s production-ready but not a starter kit. Zero additional configuration needed after creating an app. Dedicated IDE for Rekit development. Command line tools to manage actions, reducers, components and pages. Bootstrapped by create-react-app, all your knowledge about it still works. Use Webpack 3 for bundling. Use React-router for routing and it&apos;s configured with Redux reducer. Use Less or Sass as CSS transpilers. Use jest, enzyme for testing.